Welcome to Gatlinburg Tennessee Attractions! The Gatlinburg area is right on top of our family friendly vacation destinations for children and adults of all ages. Whether you visit for the majestic natural beauty, the local flavor of the quaint artisan shops and galleries, or the many exciting fun attractions, Gatlinburg has a year round vacation opportunity for your family. Sit back and relax and see how you can fully experience the gateway to the Great Smoky Mountains. If you are looking for a vacation area for your family gathering, Gatlinburg Tennessee attractions and the Great Smoky Mountains area can help you create memories your family will treasure, year after year. Did you know that Gatlinburg is the major gateway to the Great Smoky Mountains National Park? The Park has over 500,000 acres of forests and receives more than ten million visitors per year making it the most visited national park in the U.S. The Park is open all year around, is free to the public and boasts of over 800 miles of hiking trail with many rivers and waterfalls with endless majestic views. Whatever you do, don’t forget your camera because this area has picture perfect scenic opportunity around every bend in the road. A good place to start Gatlinburg Tennessee attractions would be the two main visitor centers inside the national park. The Sugarland’s Center is nearest to the Gatlinburg entrance and the Oconaluftee Center nearest to Cherokee North Carolina. These ranger stations provide exhibits on wildlife, geology, geography and history of the park area. This peaceful mountain destination offers scenic mountain views, abundant chances to view wildlife and well preserved examples of interesting historical buildings. This would include a grist mill, a variety of barns, several churches a great collection of log homes and pioneer buildings offering the history of its early inhabitants. Sure, you can drive straight through the park, but if you have a little time and energy, take some to experience the Smokies. There is a lot of wildlife to be seen, including deer, turkeys, foxes and all kinds of other animals. We even saw a mother bear with her cubs on our last trip. Your kids will remember some of the more simple things, like walking on the large river rocks and wading in the crystal clear water of the many babbling creeks and rivers. Ours did! Of course, we have kids too, so we know that the beauty of the mountains will only hold their interest so long. Possibly just long enough to find a theme, adventure or water park! 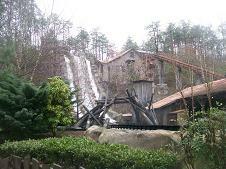 Gatlinburg Tennessee attractions has the information you need to choose from all the attractions in the area. No matter your choice, there’s fun to be had on your vacation for the kids and the kids at heart. Your vacation includes several choices of indoor and outdoor water parks. On the other hand why choose? Stay at one of the large new resort water parks and then hit one of the largest outdoor water parks in the country. Take the plunge with a mountain water park adventure with cool and exciting fun activities for the entire family. It doesn’t matter what time of year it is. Gatlinburg Tennessee attractions now has water parks for every season! Gatlinburg is a great place for one and all to enjoy your favorite outdoor activity. 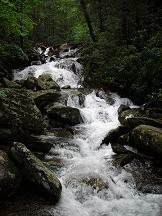 Come to relax and take in the natural beauty and fantastic scenery of the Great Smoky Mountains. See and enjoy! Gatlinburg is a great place for everyone to enjoy a favorite indoor or outdoor activity. Come to relax and take in the beauty or enjoy your choice of hundred’s of attractions and unique venues that make Gatlinburg so popular. The area is now the 6th most visited destination in the country. And right next door, the Great Smoky Mountains National Park is the #1 most visited National Park in the country. Gatlinburg Tennessee attractions is also home to several entertaining shows and unique attractions. The area theaters present all styles of music, dance, comedy, variety and magical illusions presenting wholesome family entertainment. You can also visit several areas featuring a unique style of souvenir, craft and specialty shops. And of course the go cart track circuit is a must. There is truly something for everyone. Gatlinburg Tennessee attractions provides great information on plenty of lodging and dining choices. If you want a home away from home, then you’ve come to the right place! If you are hungry, choose the simplicity of fast food, enjoy a picnic in the Smoky Mountains, or experience restaurants that offer home cooking. As far as lodging goes, well Gatlinburg has it all. Choose from secluded cabins in the mountains, resort hotels, mountainside chalets, campgrounds and more! Gatlinburg also offers every type of lodging and dining, whether you are planning events such as family vacations, a weekend out, reunions, or a romantic getaway for two. "Photo by Gordon Brugman of Flickriver Gallery"